Is Earth the largest garbage dump in the Universe? I don’t know. But it’s a safe bet that Earth would be a contender were such a competition to be held. Let me explain why. To start, just listing the types of rubbish generated by humans or the locations into which each of these is dumped is a staggering task beyond the scope of one article. Nevertheless, I will give you a reasonably comprehensive summary of the types of garbage being generated (focusing particularly on those that are less well known), the locations into which the garbage is being dumped and some indication of what is being done about it and what you can do too. But before doing so, it is worth highlighting just why this is such a problem, prompting the United Nations Environment Programme to publish this recent report: ‘Towards a pollution-free planet’. As noted by Baher Kamal in his commentary on this study: ‘Though some forms of pollution have been reduced as technologies and management strategies have advanced, approximately 19 million premature deaths are estimated to occur annually as a result of the way societies use natural resources and impact the environment to support production and consumption.’ See ‘Desperate Need to Halt “World’s Largest Killer” – Pollution’ and ‘Once Upon a Time a Planet… First part. Pollution, the world’s largest killer’. And that is just the cost in human lives. So what are the main types of pollution and where do they end up? The garbage, otherwise labelled ‘pollution’, that we dump into our atmosphere obviously includes the waste products from our burning of fossil fuels and our farming of animals. Primarily this means carbon dioxide, methane and nitrous oxide generated by driving motor vehicles and burning coal, oil and gas to generate electricity, and agriculture based on the exploitation of animals. This is having a devastating impact on Earth’s climate and environment with a vast array of manifestations adversely impacting all life on Earth. See, for example, ‘The World Is Burning’ and‘The True Environmental Cost of Eating Meat’. But these well-known pollutants are not the only garbage we dump into the atmosphere. Airline fuel pollutants from both civil and military aircraft have a shocking impact too, with significant adverse public health outcomes. Jet emissions, particularly the highly carcinogenic benzpyrene, can cause various cancers, lymphoma, leukemia, asthma, and birth defects. Jet emissions affect a 25 mile area around an airport; this means that adults, children, animals and plants are ‘crop dusted’ by toxic jet emissions for 12 miles from a runway end. ‘A typical commercial airport spews hundreds of tons of toxic pollutants into our atmosphere every day. These drift over heavily populated areas and settle onto water bodies and crops.’ Despite efforts to inform relevant authorities of the dangers in the USA, for example, they ‘continue to ignore the problem and allow aviation emissions to remain unregulated, uncontrolled and unreported’. See Aviation Justice. It is no better in other countries. Another category of atmospheric pollutants of which you might not be aware is the particulate aerosol emitted into the atmosphere by the progressive wear of vehicle parts, especially synthetic rubber tyres, during theirservice life. Separately from this, however, there are also heavier pollutants from wearing vehicle tyres and parts, as well as from the wearing away of road surfaces, that accumulate temporarily on roads before being washed off into waterways where they accumulate. While this substantial pollution and health problem has attracted little research attention, some researchers in a variety of countries have been investigating the problem. In the USA as early as 1974, ‘tire industry scientists estimated that 600,000 metric tonnes of tire dust were released by tire wear in the U.S., or about 3 kilograms of dust released from each tire each year’. In 1994, careful measurement of air near roadways with moderate traffic ‘revealed the presence of 3800 to 6900 individual tire fragments in each cubic meter of air’ with more than 58.5% of them in the fully-breathable size range and shown to produce allergic reactions.See ‘Tire Dust’. Another pollution problem low on the public radar results from environmental modification techniques involving geoengineering particulates being secretly dumped into the atmosphere by the US military for more than half a century, based on research beginning in the 1940s. This geoengineering has been used to wage war on the climate, environment and ultimately ourselves. See, for example, ‘Engineered Climate Cataclysm: Hurricane Harvey’, ‘Planetary Weapons and Military Weather Modification: Chemtrails, Atmospheric Geoengineering and Environmental Warfare’, ‘Chemtrails: Aerosol and Electromagnetic Weapons in the Age of Nuclear War’ and ‘The Ultimate Weapon of Mass Destruction: “Owning the Weather” for Military Use’. With ongoing official denials about the practice, it has fallen to the ongoing campaigning of committed groups such as GeoEngineering Watch to draw attention to and work to end this problem. Despite the enormous and accelerating problems already being generated by the above atmospheric pollutants, it is worth pausing briefly to highlight the potentially catastrophic nature of the methane dischargesnow being released by the warming that has already taken place and is still taking place. A recent scientific study published by the prestigious journal Palaeoworld noted that ‘Global warming triggered by the massive release of carbon dioxide may be catastrophic, but the release of methane from hydrate may be apocalyptic.’ This refers to the methane stored in permafrost and shelf sediment. Warning of the staggering risk, the study highlights the fact that the most significant variable in the Permian Mass Extinction event, which occurred 250 million years ago and annihilated 90 percent of all the species on Earth, was methane hydrate. See ‘Methane Hydrate: Killer cause of Earth’s greatest mass extinction’and ‘Release of Arctic Methane “May Be Apocalyptic,” Study Warns’. How long have we got? Not long, with a recent Russian study identifying ‘7,000 underground [methane] gas bubbles poised to “explode” in Arctic’. Is much being done about this atmospheric pollutionincluding the ongoing apocalyptic release of methane? Well, there is considerable ‘push’ to switch to renewable (solar, wind, wave, geothermal) energy in some placesand to produce electric cars in others. But these worthwhile initiatives aside, and if you ignore the mountain of tokenistic measures that are sometimes officially promised, the answer is ‘not really’ with many issues that critically impact this problem (including rainforest destruction, vehicle emissions, geoengineering, jet aircraft emissions and methane releases from animal agriculture) still being largely ignored. If you want to make a difference on this biosphere-threatening issue of atmospheric pollution, you have three obvious choices to consider. Do not travel by air, do not travel by car and do not eat meat (and perhaps other animal products). This will no doubt require considerable commitment on your part. But without your commitment in these regards, there is no realistic hope of averting near-term human extinction. So your choices are critical. Many people will have heard of the problem of plastic rubbish being dumped into the ocean. Few people, however, have any idea of the vast scale of the problem, the virtual impossibility of cleaning it up and the monumental ongoing cost of it, whether measured in terms of (nonhuman) lives lost,ecological services or financially. And, unfortunately, plastic is not the worst pollutant we are dumping into the ocean but I will discuss it first. In a major scientific study involving 24 expeditions conducted between 2007 and 2013, which was designed to estimate ‘the total number of plastic particles and their weight floating in the world’s oceans’ the team of scientists estimated that there was ‘a minimum of 5.25 trillion particles weighing 268,940 tons’. See ‘Plastic Pollution in the World’s Oceans: More than 5 Trillion Plastic Pieces Weighing over 250,000 Tons Afloat at Sea’ and ‘Full scale of plastic in the world’s oceans revealed for first time’. Since then, of course, the problem has become progressively worse. See ‘Plastic Garbage Patch Bigger Than Mexico Found in Pacific’and ‘Plastic Chokes the Seas’. ‘Does it matter?’ you might ask. According to this report, it matters a great deal. See ‘New UN report finds marine debris harming more than 800 species, costing countries millions’. Can we remove the plastic to clean up the ocean? Not easily. The US National Oceanic and Atmospheric Adminstration has calculated that ‘if you tried to clean up less than one percent of the North Pacific Ocean it would take 67 ships one year’. See ‘The Great Pacific Garbage Patch’. Nevertheless, and despite the monumental nature of the problem – see ‘“Great Pacific garbage patch” far bigger than imagined, aerial survey shows’ – organizations like the Algalita Research Foundation, Ocean Cleanup and Positive Change for Marine Life have programs in place to investigate the nature and extent of the problem and remove some of the rubbish, while emphasizing that preventing plastic from entering the ocean is the key. In addition, the UN Convention on Biological Diversity outlined a series of measures to tackle the problem in its 2016 report ‘Marine Debris Understanding, Preventing and Mitigating the Significant Adverse Impacts on Marine and Coastal Biodiversity’.In February 2017, the UN launched its Clean Seas Campaign inviting governments, corporations, NGOs and individuals to sign the pledge to reduce their plastic consumption. See #CleanSeas Campaign and ‘World Campaign to Clean Torrents of Plastic Dumped in the Oceans’. 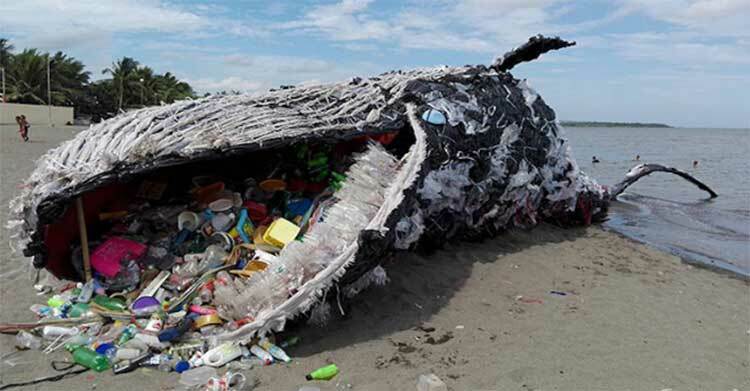 Sadly, of course, it is not just plastic that is destroying the oceans. They absorb carbon dioxide as one manifestation of the climate catastrophe and, among other outcomes, this accelerates ocean acidification, adversely impacting coral reefs and the species that depend on these reefs. In addition, a vast runoff of agricultural poisons, fossil fuels and other wastes is discharged into the ocean, adversely impacting life at all ocean depths – see ‘Staggering level of toxic chemicals found in creatures at the bottom of the sea, scientists say’– and generating ocean ‘dead zones’: regions that have too little oxygen to support marine organisms. See ‘Our Planet Is Exploding With Marine “Dead Zones”’. Since the Fukushima nuclear reactor disaster in 2011, and despite the ongoing official coverup, vast quantities of radioactive materials are being ongoingly discharged into the Pacific Ocean, irradiating everything within its path. See ‘Fukushima: A Nuclear War without a War: The Unspoken Crisis of Worldwide Nuclear Radiation’. Finally, you may not be aware that there are up to 70 ‘still functional’ nuclear weapons as well as nine nuclear reactors lying on the ocean floor as a result of accidents involving nuclear warships and submarines. See ‘Naval Nuclear Accidents: The Secret Story’ and ‘A Nuclear Needle in a Haystack The Cold War’s Missing Atom Bombs’. Virtually nothing is being done to stem the toxic discharges, contain the Fukushima radiation releases or find the nuclear weapons and nuclear reactors on the ocean floor. Many people would be familiar with the contaminants that find their way into Earth’s wetlands, rivers, creeks and lakes. Given corporate negligence, this includes all of the chemical poisons and heavy metals used in corporate farming and mining operations, as well as, in many cases around the world where rubbish removal is poorly organised, the sewage and all other forms of ‘domestic’ waste discharged from households. Contamination of the world’s creeks, rivers, lakes and wetlands is now so advanced that many are no longer able to fully support marine life. For brief summaries of the problem, see ‘Pollution in Our Waterways is Harming People and Animals – How Can You Stop This!’, ‘Wasting Our Waterways: Toxic Industrial Pollution and the Unfulfilled Promise of the Clean Water Act’and ‘China’s new weapon against water pollution: its people’. However, while notably absent from the list above, these contaminants also include radioactive waste from nuclear tests – see ‘Groundwater drunk by BILLIONS of people may be contaminated by radioactive material spread across the world by nuclear testing in the 1950s’ – and the chemical contamination caused by hydraulic fracturing (fracking) in search of shale gas, for which about 750 chemicals and components, some extremely toxic and carcinogenic like lead and benzene, have been used. See ‘Fracking chemicals’. There are local campaigns to clean up rivers, creeks, lakes and wetlands in many places around the world, focusing on the primary problems – ranging from campaigning to end poison runoffs from mines and farms to physically removing plastic and other trash – in that area. But a great deal more needs to be done and they could use your help. Our unsustainable commercial farming and soil management practices are depleting the soil of nutrients and poisoning it with synthetic fertilisers, herbicides, pesticides and antibiotics (the latter contained in animal manure) at such a prodigious rate that even if there were no other adverse impacts on the soil, it will be unable to sustain farming within 60 years. See ‘Only 60 Years of Farming Left If Soil Degradation Continues’. But not content to simply destroy the soil through farming, we also contaminate it with heavy metal wastes from industrial activity, as well as sewer mismanagement – see ‘“Black Soils” – Excessive Use of Arsenic, Cadmium, Lead, Mercury…’– the waste discharges from corporate mining – see, for example, ‘The $100bn gold mine and the West Papuans who say they are counting the cost’ – and the radioactive and many other toxic wastes from military violence, discussed below. We also lose vast quantities of soil by extensive clearfelling of pristine forests to plant commercially valuable but ecologically inappropriate ‘garbage species’ (such as palm oil trees – see ‘The Great Palm Oil Scandal’ – soya beans – see ‘Soy Changes Map of Brazil, Set to Become World’s Leading Producer’ – and biofuel crops). This leaves the soil vulnerable to rainfall which carries it into local creeks and rivers and deposits it downstream or into the ocean. Staggering though it may sound, we are losing tens of billions of tonnes of soil each year, much of it irreversibly. Is anything being done? A little. In response to the decades-long push by some visionary individuals and community organizations to convert all farming to organic,biodynamic and/or permaculture principles, some impact is being made in some places to halt the damage caused by commercial farming. You can support these efforts by buying organically or biodynamically-certified food (that is, food that hasn’t been poisoned) or creating a permaculture garden in your own backyard. Any of these initiatives will also benefit your own health. Of course, there is still a long way to go with the big agricultural corporations such as Monsanto more interested in profits than your health. See‘Killing Us Softly – Glyphosate Herbicide or Genocide?’, ‘Top 10 Poisons that are the legacy of Monsanto’ and‘Monsanto Has Knowingly Been Poisoning People for (at Least) 35 Years’. One other noteworthy progressive change occurred in 2017 when the UN finally adopted the Minimata Convention, to curb mercury use. See ‘Landmark UN-backed treaty on mercury takes effect’and ‘Minamata Convention, Curbing Mercury Use, is Now Legally Binding’. As for the other issues mentioned above, there is nothing to celebrate with mining and logging corporations committed to their profits at the expense of the local environments of indigenous peoples all over the world and governments showing little effective interest in curbing this or taking more than token interest in cleaning up toxic military waste sites. As always, local indigenous and activist groups often work on these issues against enormous odds. See, for example, ‘Ecuador Endangered’. Apart from supporting the work of the many activist groups that work on these issues, one thing that each of us can do is to put aside the food scraps left during meal preparation (or after our meal) and compost them. Food scraps and waste are an invaluable resource: nature composts this material to create soil and your simple arrangement to compost your food scraps will help to generate more of that invaluable soil we are losing. One form of garbage we have been producing, ‘under the radar’, in vast quantities for decades is antiobiotic and antifungal drug residue. See ‘Environmental pollution with antimicrobial agents from bulk drug manufacturing industries… associated with dissemination of… pathogens’. Are governments acting to end this practice? According to the recent and most comprehensive study of the problem ‘international regulators are allowing dirty drug production methods to continue unchecked’. See ‘Big Pharma’s pollution is creating deadly superbugs while the world looks the other way’. Given the enormous power of the pharmaceutical industry, which effectively controls the medical industry in many countries, the most effective response we can make as individuals is to join the rush to natural health practitioners (such as practitioners of homeopathy, ostepathy, naturopathy, Ayurvedic medicine, herbal medicine and Chinese medicine) which do not prescribe pharmaceutical drugs. For further ideas, see ‘Defeating the Violence in Our Food and Medicine’. Perhaps the most frightening pollutant that we now risk releasing into the environment goes beyond the genetic mutilation of organisms (GMOs) which has been widely practiced by some corporations, such as Monsanto, for several decades. See, for example, ‘GM Food Crops Illegally Growing in India: The Criminal Plan to Change the Genetic Core of the Nation’s Food System’. The implications for the environment, food security, peace, and even social stability are breathtaking, particularly given that existing ‘government regulations for the use of genetic engineering in agriculture have allowed widespread genetic contamination of the food supply and the environment.’ See ‘Reckless Driving: Gene drives and the end of nature’. Consistent with their track records of sponsoring, promoting and using hi-tech atrocities against life, the recently released (27 October 2017) ‘Gene Drive Files’ reveal that the US military and individuals such as Bill Gates have been heavily involved in financing research, development and promotion of this grotesque technology. See ‘Military Revealed as Top Funder of Gene Drives; Gates Foundation paid $1.6 million to influence UN on gene drives’ and the ‘Gene Drive Files’. ‘Why would the US military be interested?’ you might ask. Well, imagine what could be done to an ‘enemy’ race with an extinction gene drive. As always, while genuinely life-enhancing grassroots initiatives struggle for funding, any project that offers the prospect of huge profits – usually at enormous cost to life – gets all the funding it needs. If you haven’t realised yet that the global elite is insane, it might be worth pondering it now. See ‘The Global Elite is Insane’. Is anything being done about these life-destroying technologies? A number of groups campaign against genetic engineering and SynBioWatchworks to raise awareness of gene drives, to carefully explain the range of possible usesforthem and to expose the extraordinary risks and dangers of the technology. You are welcome to participate in their efforts too. A nanoparticle is a microscopic particle whose size is measured in nanometers. One nanometer is one billionth of a meter. In simple English: Nanoparticles are extraordinarily tiny. Unfortunately, however, nanoparticle contamination of medicines is already well documented. See ‘New Quality-Control Investigations on Vaccines: Micro- and Nanocontamination’. Another report indicates that ‘Some nanomaterials may also induce cytotoxic or genotoxic responses’. See ‘Toxicity of particulate matter from incineration of nanowaste’.What does this mean? Well ‘cytotoxic’ means that something is toxic to the cells and ‘genotoxic’ describes the property of chemical agents that damage the genetic information within a cell, thus causing mutations which may lead to cancer. Beyond the toxic problems with the nanoparticles themselves, those taking a wider view report the extraordinary difficulties of managing nanowaste. In fact, according to one recent report prepared for the UN: ‘Nanowaste is notoriously difficult to contain and monitor; due to its small size, it can spread in water systems or become airborne, causing harm to human health and the environment.’ Moreover ‘Nanotechnology is growing at an exponential rate, but it is clear that issues related to the disposal and recycling of nanowaste will grow at an even faster rate if left unchecked.’ See ‘Nanotechnology, Nanowaste and Their Effects on Ecosystems: A Need for Efficient Monitoring, Disposal and Recycling’. Despite this apparent nonchanlance about the health impacts of nanowaste, one recent report reiterates that ‘Studies on the toxicity of nanoparticles… are abundant in the literature’. See ‘Toxicity of particulate matter from incineration of nanowaste’. So, as these recent reports makes clear, little is being done to monitor, measure or control these technologies or monitor, measure and control the harmful effects of discharging nanowaste. Fortunately, with the usual absence of government interest in acting genuinely on our behalf, activist groups such as the Institute for Agriculture and Trade Policy and the Organic Consumers Association campaign against nanotechnology as part of their briefs. Needless to say, however, a lot more needs to be done. Not content to dump our garbage in, on or under the Earth, we also dump our junk in Space too. ‘How do we do this?’ you may well ask. Quite simply, in fact. We routinely launch a variety of spacecraft into Space to either orbit the Earth (especially satellites designed to perform military functions such as spying, target identification and detection of missile launches but also satellites to perform some civilian functions such as weather monitoring, navigation and communication) or we send spacecraft into Space on exploratory missions (such as the Mars Exploration Rover Opportunity). However, getting spacecraft into Space requires the expenditure of vast amounts of energy (which adds to pollution of the atmosphere) and the progressive discarding of rocket propulsion sections of the launch craft. Some of these fall back to Earth as junk but much of it ends up orbiting the Earth as junk. So what form does this junk take? It includes inactive satellites, the upper stages of launch vehicles, discarded bits left over from separation, frozen clouds of water and tiny flecks of paint. All orbiting high above Earth’s atmosphere. With Space junk now a significant problem, the impact of junk on satellites is regularly causing damage and generating even more junk. Is it much of a problem? Yes, indeed. The problem is so big, in fact, that NASA in the USA keeps track of the bigger items, which travel at speeds of up to 17,500 mph, which is ‘fast enough for a relatively small piece of orbital debris to damage a satellite or a spacecraft’. How many pieces does it track? By 2013, it was tracking 500,000 pieces of space junk as they orbited the Earth. See ‘Space Debris and Human Spacecraft’. Of course, these items are big enough to track. But not all junk is that big. In fact, a recent estimate indicates that the number of Space junk items could be in excess of 100 trillion. See ‘Space Junk: Tracking & Removing Orbital Debris’. Is anything being done about Space junk? No government involved in Space is really interested: It’s too expensive for that to be seriously considered. But given the ongoing government and military interest in weaponizing Space, as again reflected in the recent US ‘Nuclear Posture Review 2018’, which would add a particularly dangerous type of junk to Space, the Global Network Against Weapons and Nuclear Power in Space has been conducting an effective worldwide campaign since 1992 to mobilize resistance to weapons and nuclear power being deployed and used in Space. The carnage and waste produced by preparation for and the conduct of military violence is so vast that it almost defies description and calculation. In its most basic sense, every single item produced to perform a military function – from part of a uniform to a weapon – is garbage: an item that has no functional purpose (unless you believe that killing people is functional). To barely touch on it here then, military violence generates a vast amount of pollution, which contaminates the atmosphere, oceans, all fresh water sources, and the soil with everything from the waste generated by producing military uniforms to the radioactive waste which contaminates environments indefinitely. For just a taste of this pollution, see the Toxic Remnants of War Project, the film ‘Scarred Lands & Wounded Lives’, ‘U.S. Military World’s Largest Polluter – Hundreds of Bases Gravely Contaminated’, ‘Depleted Uranium and Radioactive Contamination in Iraq: An Overview’ and ‘The Long History of War’s Environmental Costs’. Many individuals, groups and networks around the world campaign to end war. See, for example, War Resisters’ International, the International Peace Bureau and World Beyond War. You can participate in these efforts. Partly related to military violence but also a product of using nuclear power, humans generate vast amounts of waste from exploitation of the nuclear fuel cycle. This ranges from the pollution generated by mining uranium to the radioactive waste generated by producing nuclear power or using a nuclear weapon. But it also includes the nuclear waste generated by accidents such as that at Chernobyl and Fukushima. Again, for just a taste of the monumental nature of this problem, see ‘Emergency Declared at Nuclear Waste Site in Washington State’,‘Disposing of Nuclear Waste is a Challenge for Humanity’ and ‘Three Years Since the Kitty Litter Disaster at Waste Isolation Pilot Plant’. While the London Dumping Convention permanently bans the dumping of radioactive and industrial waste at sea (which means nothing in the face of the out-of-control discharges from Fukushima, of course) – see ‘1993 – Dumping of radioactive waste at sea gets banned’ – groups such as Friends of the Earth and Greenpeace continue to campaign against the nuclear industry (including radioactive waste dumping) and to promote renewable energy. They would be happy to have your involvement. Some of the garbage that ends up being dumped is done via our bodies. Apart from the junk food produced at direct cost to the environment, the cost of these poisoned, processed and nutritionally depleted food-like substances also manifests as ill-health in our bodies and discharges of contaminated waste. Rather than eating food that is organically or biodynamically grown and healthily prepared, most of us eat processed food-like substances that are poisoned (that is, grown with large doses of synthetic fertilizers, herbicides and pesticides that also destroy the soil and kill vast numbers of insects – see ‘Death and Extinction of the Bees’ and ‘Insectageddon: farming is more catastrophic than climate breakdown’ – and then cook this food in rancid oils and perhaps even irradiate (microwave) it before eating. Although microwave ovens were outlawed in the Soviet Union in 1976, they remain legal elsewhere. See ‘The Hidden Hazards of Microwave Cooking’, ‘How Your Microwave Oven Damages Your Health In Multiple Ways’ and ‘Microwave Cooking is Killing People’. Unfortunately, however, considerable official effort still goes into developing new ways to nuclearize (contaminate) our food – see ‘Seven examples of nuclear technology improving food and agriculture’ – despite long-established natural practices that are effective and have no damaging side effects or polluting outcomes. But apart from poisoned, processed and unhealthily prepared food, we also inject our bodies with contaminated vaccines – see ‘New Quality-Control Investigations on Vaccines: Micro- and Nanocontamination’, ‘Dirty Vaccines: New Study Reveals Prevalence of Contaminants’ and ‘Aluminum, Autoimmunity, Autism and Alzheimer’s’ – consume medically-prescribed antibiotics (see section above) and other drugs – see ‘The Spoils of War: Afghanistan’s Multibillion Dollar Heroin Trade. Washington’s Hidden Agenda: Restore the Drug Trade’– and leave the environment to deal with the contaminated waste generated by their production and the discharges from our body. Many individuals and organizations all over the world work to draw attention to these and related issues, including the ‘death-dealing’ of doctors, but the onslaught of corporate media promotion and scare campaigns means that much of this effort is suppressed. Maintaining an unhealthy and medically-dependent human population is just too profitable. If you want to genuinely care for your health and spare the environment the toxic junk dumped though your body, the ideas above in relation to growing and eating organic/biodynamic food and consulting natural health practitioners are a good place to start. For many people, of course, dealing with their daily garbage requires nothing more than putting it into a rubbish bin. But does this solve the problem? Well, for a start, even recycled rubbish is not always recycled, and even when it is, the environmental cost is usually high. In fact, the various costs of dealing with rubbish is now so severe that China, a long-time recipient of waste from various parts of the world, no longer wants it. See ‘China No Longer Wants Your Trash. Here’s Why That’s Potentially Disastrous’. Of course there are also special events that encourage us to dump extra rubbish into the Earth’s biosphere. Ever thought about what happens following special celebrations like Christmas? See ‘The Environmental Christmas Hangover’ or the waste discharged from cruise ships? See ‘16 Things Cruise Lines Never Tell You’. Does all this pollution really matter? Well, as mentioned at the beginning, we pay an enormous cost for it both in terms of human life but in other ways too. See ‘The Lancet Commission on pollution and health’. One category of junk, which is easily overlooked and on which I will not elaborate, is the endless stream of junk information with which we are bombarded. Whether it is corporate ‘news’ (devoid of important news about our world and any truthful analysis of what is causing it) on television, the radio or in newspapers, letterbox advertising, telephone marketing or spam emails, our attention is endlessly distracted from what matters leaving most humans ill-informed and too disempowered to resist the onslaught that is destroying our world. So what can we do about all of the junk identified above? Well, unless you want to continue deluding yourself that some token measures taken by you, governments, international organizations (such as the United Nations) or industry are going to fix all of this, I encourage you to consider taking personal action that involves making a serious commitment. This is because, at the most fundamental level, it is individuals who consume and then discharge the waste products of their consumption. And if you choose what you consume with greater care and consume less, no one is going to produce what you don’t buy or discharge the waste products of that production on your behalf. Remember Gandhi? He was not just the great Indian independence leader. His personal possessions at his death numbered his few items of self-made clothing and his spectacles. We can’t all be like Gandhi but he can be a symbol to remind us that our possessions and our consumption are not the measure of our value. To ourselves or anyone else. If the many itemized suggestions made above sound daunting, how does this option sound? Do you think that you could reduce your consumption by 10% this year. ?And, ideally, do it in each of seven categories: water, household energy, vehicle fuel, paper, plastic, metals and meat? Could you do it progressively, reducing your consumption by 10% each year for 15 consecutive years? See ‘The Flame Tree Project to Save Life on Earth’. I am well aware of the emotional void that makes many people use ‘shopping therapy’ to feel better or to otherwise consume, perhaps by traveling, to distract themselves. If you are in this category, then perhaps you could tackle this problem at its source by ‘Putting Feelings First’. No consumer item or material event can ever fill the void in your Selfhood. But you can fill this void by traveling the journey to become the powerful individual that evolution gave you the potential to be. If you want to understand how you lost your Selfhood, see‘Why Violence?’ and ‘Fearless Psychology and Fearful Psychology: Principles and Practice’. You might also help ensure that children do not acquire the consumption/pollution addiction by making ‘My Promise to Children’. If you want to campaign against one of the issues threatening human survival discussed briefly above, consider planning a Nonviolent Campaign Strategy. And if you wish to commit to resisting violence of all kinds, you can do soby signing the online pledge of ‘The People’s Charter to Create a Nonviolent World’. In the final analysis, each of us has a choice. We can contribute to the ongoing creation of Earth as the planet of junk. Or we can use our conscience, intelligence and determination to guide us in resisting the destruction of our world. Robert J. Burrowes has a lifetime commitment to understanding and ending human violence. He has done extensive research since 1966 in an effort to understand why human beings are violent and has been a nonviolent activist since 1981. He is the author of ‘Why Violence?’ His email address is flametree@riseup.net and his website is here.